The Mary Pappert School of Music’s Moscow on the Bluff series is back. The series features works by renowned Russian composers performed by numerous music school faculty, the Pittsburgh Symphony Orchestra (PSO) and other internationally acclaimed artists. Concert IV: Pictures at an Exhibition will be held this Sunday, Jan. 20, at 3 p.m. in the music school’s PNC Recital Hall. 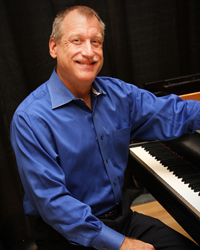 David Allen Wehr, the Jack W. Geltz Piano Chair in the music school and the series’ artistic director, will perform Modest Mussorgsky’s masterpiece Pictures at an Exhibition. Originally written for piano, the piece only became widely known after French composer Maurice Ravel orchestrated it years after Mussorgsky’s death. In addition, Sergei Prokofieff’s Sonata for Flute and Piano will be performed by Lorna McGree, principal flute for the PSO, and Wehr, who will then join PSO Principal Cellist Anne Martindale Williams for Sergei Rachmaninoff’s Sonata. During the 2:30 p.m. pre-concert discussion, McGhee will talk about her career as one of the world’s premier flutists. In the case of inclement weather, attendees can check www.duq.edu/bluffseries for cancellation updates. Tickets can be purchased online or by calling 800.838.3006. For more information on the Moscow on the Bluff series, visit duq.edu/bluffseries.